Not sure how to navigate the largest selection of Amish furniture online? 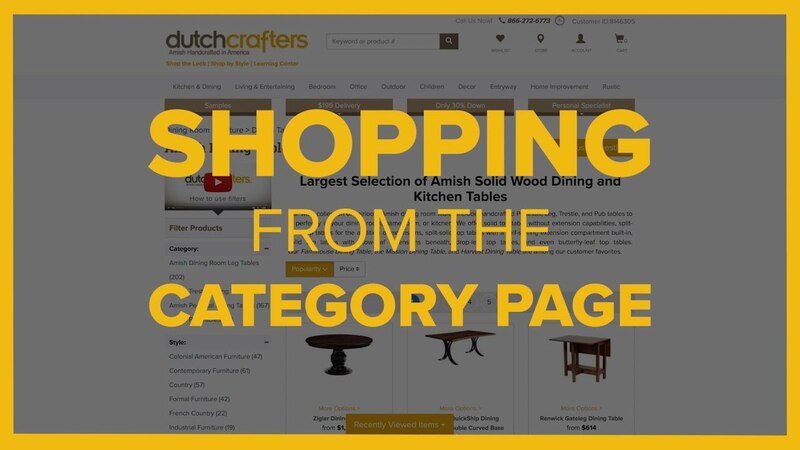 Here’s your guide to getting started shopping from the dutchcrafters.com category pages on desktop and laptop. Visit DutchCrafters Category Pages (https://www.dutchcrafters.com/Dining-Room-Sets/cat/722) where we make it easy to narrow down your selection to find just what you need. DutchCrafters category pages include Amish Dining Room Furniture, Amish Living Room Furniture, Amish Bedroom Furniture, Amish Office Furniture, and Outdoor Poly Furniture, as well as numerous sub-categories for each. Thanks for visiting DutchCrafters. You’ve found the best way to browse products on DutchCrafters, for most customers: through the category page. With the largest selection of Amish furniture products on the web, we know it can be overwhelming, but we give you many ways to find exactly what you’re looking for. By default, our large selection of products is arranged by popularity. But we make it easy to find just what you’re looking for. You can sort by price instead, although product prices will change depending on which options you end up selecting. Filters, in the left sidebar, help you narrow down your options to find what’s right for you. Narrow down your selection by style, wood type, or even State of origin. At DutchCrafters, we guarantee that your entire set will be finished together for the best color match. We’re unique in that we offer furniture from the best woodworkers in Indiana, Ohio, and Pennsylvania. However, selecting your whole set from the same state may help us finish your order and deliver it to you sooner! The filter sections can be collapsed if you do not find them helpful to your search. Along with our filters, icons indicate products with certain characteristics, such as those that are Amish Made, Top Sellers, or those available for Quick Ship. Choose to move on to the next page or simply “Load More” to view more products on the same page. The Category filters will take you to a more specific category page to narrow down your interest. But you can always return to the broader category page through the breadcrumb navigation. If you have any questions, don’t hesitate to use the “Ask Us A Question” button or give us a call to speak with a personal furniture specialist. Once you’ve found a product you want to take a deeper look at, select it and move on to the product page. Thanks for shopping at DutchCrafters!